This is Lis Simon bride Jacklyn wearing our Jewel gown! Jacklyn grew up in Davidson, Saskatchewan, just 20 minutes down the highway from Kenaston, where Jake grew up. They met in Davidson in 2013 while both working there a couple weeks before Jacklyn moved to Saskatoon. Their first date was at Winston's English Pub in Saskatoon, and the rest is history! Jacklyn and Jake had just gotten back from the city, where they had dropped Jake's dad off at the airport and picked up a new Christmas tree. Once they had brought everything into the house, Jacklyn left the room for a moment. She came back to find Jake with the blinds down and their beautiful new Christmas tree ornaments lit up with a ring on top of one of the trees. He proposed, and she happily accepted! They began calling their friends and family, and were able to celebrate with them that evening at a fundraiser in town.
" I had the best dress shopping experience. All the ladies at Exquisite are so helpful and amazing to deal with." Jacklyn went to Exquisite Fashions & Bridal, located in Saskatoon, to find her wedding dress. They knew when to cut her bridesmaids off from picking out too many dresses for her to try on! Unfortunately, the day she was supposed to have all her girls there to pick her dress, there was a snowstorm and only a few made it. Jacklyn was able to have her mom and the rest of the ladies to come a few days later for her final decision, which was our Jewel gown. "I had the pleasure of wearing your Jewel gown on my wedding day, I am so in love with it! Jacklyn and Jake said "I do" in Jake's parents' backyard in Kenaston, Saskatchewan, on a beautiful, hot, summer afternoon. They then moved on to Keaston Place, the town hall, for the reception and dance! The reception was fairly traditional. Completed with a DJ, photobooth, candy bar, and sangria bar. They entered the reception to Ain't No Mountain High Enough and went straight into dinner. Their emcee surprised them with a rap she wrote to the tune of the Fresh Prince of Bel-Air theme song. The couple finished off their thank-you speech with shots of Sljivovica that were passed around beforehand. Jake's side of the family is Croatian and Sljivovica is a tradition Croatian drink. After that is when the party started and there was plenty of dancing and laughs to go around! In addition to the Sljivovica tradition, they also played the song How Do You Like Me Now by Toby Keith, and Jacklyn and Jake stood on chairs while everyone gathers around them and belts out the song while more Sljivovica was passed around. Their decor theme was rustic. 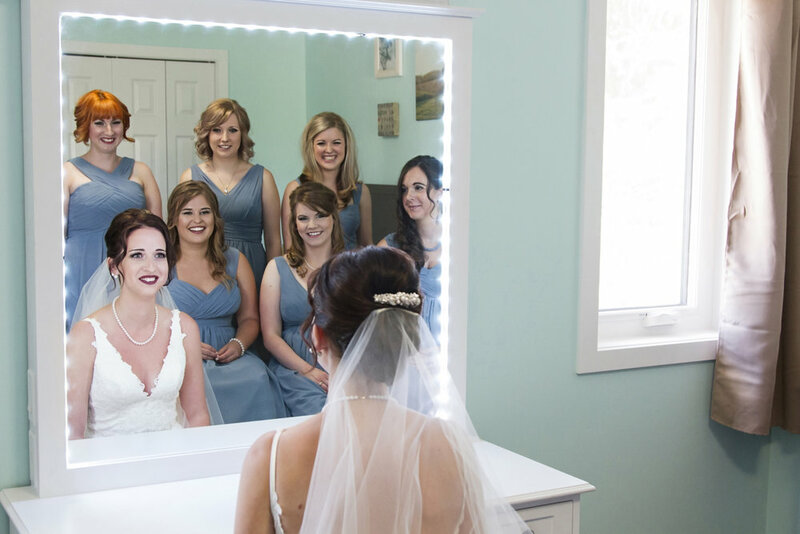 Jacklyn started with the colour she wanted the wedding party to wear and went from there! There was plenty of burlap, charcoal mason jars, and deer antlers around the room, but also several strings of warm white lights, blush pink flowers, and slate blue table runners to tie it together. Their wedding party and families helped set everything up the day before the wedding. Jacklyn and Jake went to the Temple Gardens Mineral Spa in Moose Jaw, Saskatchewan, the Monday after their wedding and they are also planning to hopefully go somewhere warm in the winter. The whole day was our favourite. Being surrounded by our friends and family helped make it the perfect day! My Main tip would be to try not to stress about the little things too much. If something doesn't work out the way you want it to, you are the only one who knows and everything will still turn out perfectly. Thank you, Jacklyn, for answering all our questions and sending up these wonderful photos!